Handball is one of the most popular team sports in much of Europe, particularly Germany, France, Spain, the Nordic countries and the countries of former Yugoslavia. 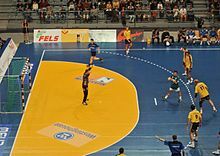 Even regular league games often draw sellout crowds to the halls where it is played and the passion and dedication with which European handball connoisseurs follow their sport knows no equal. Handball is known throughout continental Europe for its fast pace and high scores. Results like 24:22 are very common and a good goalkeeper is able to block about half the shots. In addition to good hand-eye-coordination, handball requires speed and strength as rapid "counterattacks" are crucial elements in a successful offense. While several varieties of handball have enjoyed popularity over the years Nordic dominance and its faster pace have made the indoor variety that can be played year round regardless of weather the dominant form of the game and the only one to be played professionally since at least the 1970s. The sport has many superficial similarities to soccer but also has elements of Basketball. Limiting turnovers is another crucial element in winning games as the success rate of well placed throws is rather high. Handball is played by two teams of seven players each. The goal of the game is to throw the ball, which looks a lot like a miniature soccer ball, into the opposing goal. In front of either goal a semicircle is clearly marked as off limits to all but the goalkeeper. Stepping into this circle is punished by loss of ball possession for the offense or a free throw if done by the defense to gain a defensive advantage. Jumping into the circle is allowed for a player in possession as long as (s)he shoots or passes before hitting the ground and is a crucial element in modern handball. A game takes two halves of thirty minutes each with no extra time. Time is stopped at the discretion of the referees when a long intermission in play occurs or during a team timeout. When the time for a half has elapsed, play immediately stops. Besides the goalkeeper no player may touch the ball with his feet or legs at any time. Fouls are penalized through free-throws or - in the case of more serious offenses - seven-meter throws as well as two minute penalties (i.e. the offending player is sent to the bench for two minutes and may not be replaced). Seven meter throws are similar to soccer penalties in that the goalkeeper is the only player allowed to defend the goal. They typically have a high success rate and are a crucial element of game play similar to free throws in basketball. Substitutions may be made at any time and in any number but only on the midfield line. Unlike in soccer where the only thing keeping a team from playing as defensively and passively as it pleases is the opposing team, there are rules against "passive play". Unlike in Basketball this is not measured by a shot clock but rather the judgment of the referee who will raise his or her hand to warn of an impending penalty after which no more than six passes are allowed before an attempt to score has to be made. The referee will also enforce the penalty after a certain amount of time (usually five to ten seconds) has elapsed without a change to the passive play. The penalty for passive play is the loss of ball possession and a free throw for the opposing team. To encourage more offensive play, a rule change was instituted in the 2010s that the goalkeeper can be pulled and replaced by an additional field player at any time during the game. However, this further increases the risk of rapid counterattacks, especially if the goalkeeper cannot get back onto the field in time. The German Handball Bundesliga leads the handball world in at game attendance and - arguably - quality of play. While first division teams exist throughout the country, the best of them tend to be from the North, where handball enthusiasm tends to be strongest. The German league has always attracted foreign talent and as Germany is the reigning (2016) European Champion of Handball, most of the big names play in Germany. International competitions are by and large dominated by European countries, however, the ease with which even established players can change national teams has enabled the stellar rise of Qatar, a team consisting almost entirely of naturalized non-Arabs. The EHF Champion's League is the most prestigious competition for club teams in the Handball world. It has been largely dominated by Spanish and German teams since the mid 1990s. European Championships feature a very high density of talent and intense match ups between sporting rivals. The men's edition is held every two years and was last held 2018 in Croatia. The Nordic countries, Germany and France have historically dominated European Championships. Sweden currently holds four titles, followed by France with three, Germany and Denmark with two each and Russia with one. Spain won its first title in 2018. The women's European Championships are held in the same year but at different sites and different dates. Nordic dominance is even more pronounced on the female side. Norway has won it six times, Denmark thrice and Hungary and Montenegro both have one gold medal each. The next event will be held in November/December 2018 in France. While world championships are sometimes held outside of Europe to broaden the fan base of handball outside of the countries where it has historically dominated, most World championships are held in and won by European nations. Notable exceptions are Qatar (which hosted the 2014 edition and came in second) and Brazil which won the female world cup in 2013. The 2019 edition will be held in Germany and Denmark - the first time two countries will be joint hosts. The premier tournament in international handball is the Olympics, and features teams from all over the world, through the medals are still dominated by European countries. To date, the only non-European team to have ever won an Olympic medal in men's handball is South Korea, which won the silver medal when it hosted the games in 1988. The women's tournament, however has seen South Korea enter the medal standings several times, including the winning the gold medal twice, and China also having won a medal. The Olympics are also notable in drawing media interest and coverage in countries where Handball is otherwise unknown, especially when the Olympics are held in Handball diaspora like England as in the 2012 Olympics. This travel topic about Handball in Europe is an outline and needs more content. It has a template, but there is not enough information present. Please plunge forward and help it grow! This travel guide page was last edited at 19:28, on 7 November 2018 by Wikivoyage user Hobbitschuster. Based on work by Wikivoyage users ARR8, The dog2, Mx. Granger, Traveler100 and Ikan Kekek and Wikivoyage anonymous users 152.26.84.38 and 220.76.5.120.